Yesterday was absolutely beautiful, the sun finally came out, and the grass is starting to green. It has been weeks, maybe even a month since the sun was out. Talk about dreary! 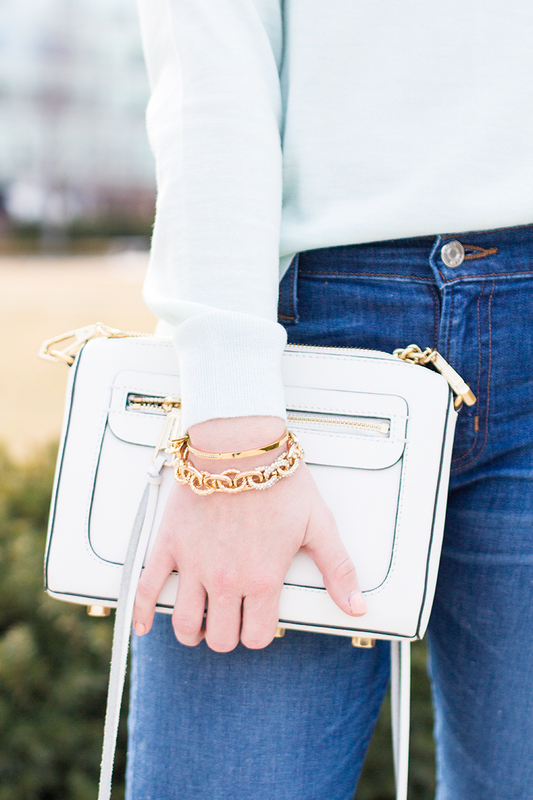 Anyways, the good weather put me a good mood so I pulled out this mint sweater and fun bauble earrings to celebrate. This is the only piece of clothing that is this color and I love it! I was surprised at how well it worked with my skin tone and hair color. 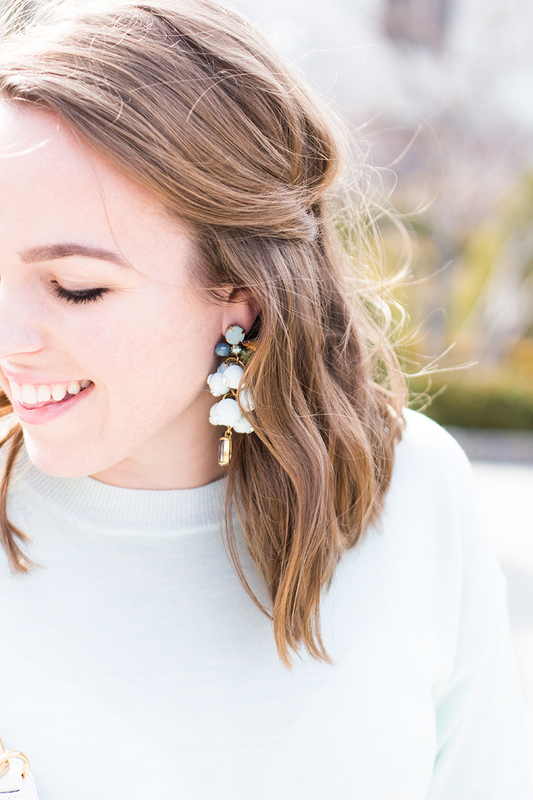 My earrings were another purchase from the J.Crew sale section. While I still cannot believe how adorable they are for the price, they are on the heavier side so if you have sensitive ears...beware! Let's talk about these jeans for a minute. I am very picky when it comes to denim. I hate jeans that have no stretch, whatsoever, they are so uncomfortable! On the other hand, I hate denim that have too much stretch they feel like leggings and they don't hold their shape. Also, I hate spending anything above $50-60 on a pair. 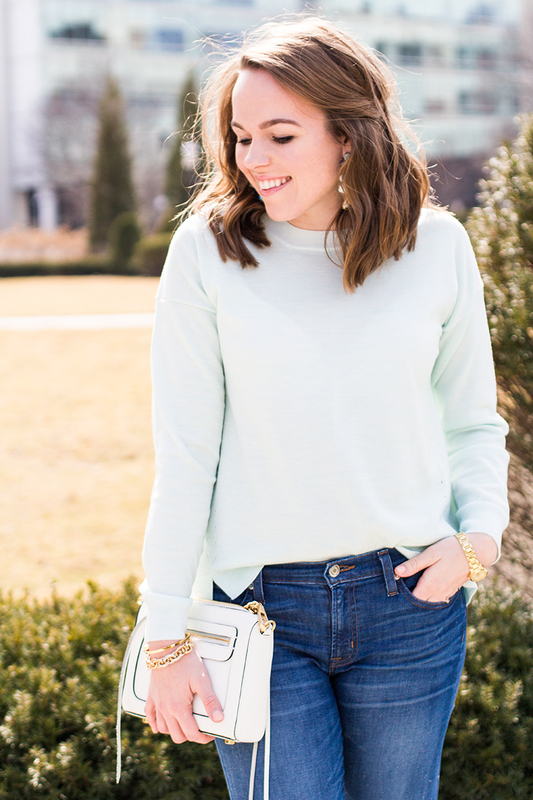 Well, I was very pleasantly surprised when I tried on the J.Crew toothpick jeans (from the sale section of course). For starters, I love the wash. It's a good true blue! When I tried them on I was even more surprised how comfortable they were. Not only do they have some spandex to stretch but they hold their shape all day long and I don't feel like they give me the "muffin-top." If you are looking for a great pair of denim that doesn't break the bank...try a pair of these on! Seriously, it's a game changer. I think I aim starting to get a hang of this seasonal wardrobe transition phase. 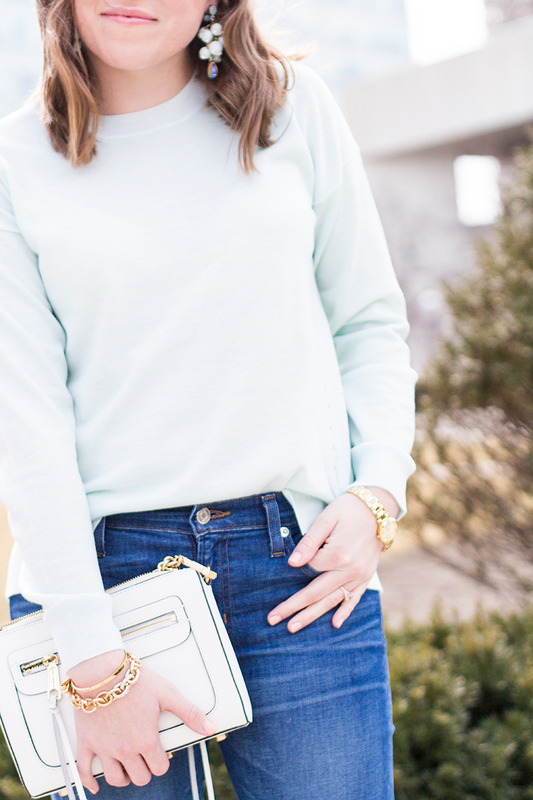 While it's not my favorite, there are pieces (such as this lightweight sweater) that are great for layering if it's chilly. What are your go-to looks when the seasons are changing? Comment below and share your thoughts!